The Costa Smeralda in Sardinia takes its name from the emerald waters off scalloped shores encrusted with granite outcroppings. An annual summer pilgrimage for sybaritic yachtsmen who anchored here in paradisiacal seclusion, the coast was fabled for its natural beauty. But when the current Aga Khan discovered it decades ago from a boat, buildings were few and architecture next to nil. Lacking water and fertile soil, it was underpopulated, underdeveloped and—except for ancient stone lookout towers—lacked a rich architectural tradition. The issue of a landscape without a strong indigenous architecture was a sensitive, even crucial, matter for the region’s future: Too much of the Mediterranean had already been overbuilt with structures insensitive to nature. The French architect Savin Couëlle started building on the island’s northeastern coast as a young man some 40 years ago, soon after the Aga Khan bought much of the coastline to develop as a seaside resort. 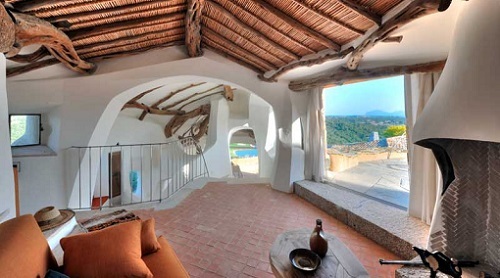 More than any other architect—perhaps even more than his father, Jacques Couëlle, principal designer of the flagship hotel, Cala di Volpe—Savin Couëlle invented the architecture that now captures the ethos of its rugged beauty. Instead of domesticating the raw landscape with civilizing geometries and polished materials, he took the raw elements of the landscape—the granite, the juniper, the contours of the land—and left them raw, giving them untamed form. The houses mushroom out of the land in organic flows. Marina Giori, who came here in 1965, when jet travel was opening the island, built a house in Porto Rotondo, a resort community immediately adjacent to the Aga Khan’s. Designed by an architect more or less imposed by local authorities, it was inappropriate, “like a chalet in Cortina—dark, with small windows,” says Giori, who vacations on the Costa Smeralda from late spring to early fall. When it came time for an expansive house more open to the sun and landscape, she turned to Couëlle. “He doesn’t import copies of houses from other parts of Italy but responds to the natural surroundings of the island and respects the beauty of the vegetation and stone,” she says. Rather than defending Giori from the sun, as the old house did, the new house virtually tracks light like a sunflower. In the living room, stone arches vault long spans that open the interiors to terraces, erasing the boundaries between inside and outside. “The wind here changes direction unpredictably, sometimes several times in a day, and I wanted a terrace in each direction so that I could always spend time outside,” says Giori, who assisted Couëlle with the interior decoration, choosing furniture on a scale that lives up to the voluminous rooms. Pioneers settling the coast scooped up the best property early, and Giori’s seaside site provides commanding views of the bay at Porto Rotondo from a rise that descends to her private beach. The landscape seems to terrace directly into the house’s several levels. “The planning of the house was evolutionary,” says the architect. “We lived the site and the house, working on the grounds, sculpting the house as if from living matter,” he says. “It was like raising a child.” Outside and inside, he trimmed the house with both natural and cut stone. The ceiling in a guest room is structured with wood beams left uncut to recall tree trunks and limbs. The stucco is an earthy ocher, and the red-tile roof-scape echoes the profile of surrounding hills. Couëlle, who modestly remarks that he has “a little piece of office in Sardinia and a little piece of office in Milan,” imports his own trusted craftsmen to his jobs, sometimes halfway around the world. “One mason specialized in the arches,” says Giori. “He worked quickly and knew just how to handle the stone in the way that fit Savin’s vision.” The craftsmen shaped the house by hand, from the nubby boulder walls down to door handles, handrails and balusters.